The $50,000 Poker Player's Championship is now down to just eight players, with the final table of the event getting underway later this afternoon. All eight players are guaranteed a minimum of $169,879 for making it to the final table, with the eventual winner walking away with $1,451,527. 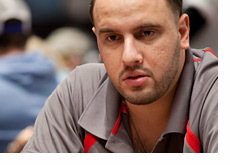 Michael Mizrachi will be looking for his second Poker Player's Championship title in the last three years. "The Grinder" took down the 2010 event for $1,559,046. A win or second place finish for Mizrachi would push him past Phil Hellmuth Jr. on the all-time tournament money list. Andy Bloch, who currently sits with the second largest chip stack, will be looking to win his second WSOP bracelet. Bloch broke his WSOP winless streak earlier at this year's World Series of Poker after taking down the $1,500 Seven Card Stud event. -despite having very minimal experience in games outside of NLHE and PLO, Viktor "Isildur1" Blom was able to cash in this event (14th, $105,235).